Thousands converged on the Zapatista community of Oventic on Friday to share a wide selection of art representing the culture, history, and resistance of the Zapatista Army of National Liberation, or EZLN. Dance, theater, music, painting, poetry, and more were put on display by the Indigenous people of the Tzotzil, Zoque, and Tzeltal communities of the Los Altos region of Chiapas for an audience of local, national, and international visitors. Under the banner CompArte — a play on words emphasizing art within the Spanish word for sharing — the EZLN aimed to highlight the role that creativity, imagination and art has historically played in revolutionary movements, from the expressionist murals of Mexican painters to the traditional African dance of independence fighters in the former Portuguese colonies of Guinea Bissau, Cape Verde, Angola and Mozambique. According to a photo essay by journalists Carlos Ogaz and Andalusia Knoll on Regeneracion Radio, many performances and works of art recounted the long history of oppression and resistance of the Zapatista peoples from colonization to the conditions that paved the way for the formation of the EZLN in the early 1990’s to the movement’s more than 20 years fighting neoliberal capitalism and building local alternatives for economic, political, and cultural autonomy. International guests at the artistic festival included Emory Douglas, U.S. artist and former Minister of Culture for the Black Panther Party. 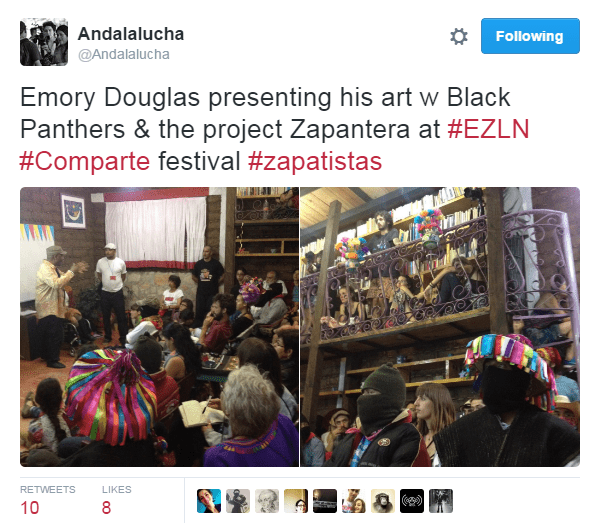 Douglas previously collaborated with the EZLN artists “Zapantera Negra,” a multimedia art project that explored artistic and political links between the Black Panther Party and the Zapatista movement. Zapantera Negra-inspired art also made an appearance at the festival. Cultural resistance in Chiapas is also set to continue Sunday as movements hold a march and cultural event in defense of “Mother Earth and territory” against mining and unwanted hydroelectric projects in the community of Pijijiapan. Showing the artistic side of the movement in Chiapas comes after police and paramilitaries violently evicted a blockade held by dissident striking teachers in the town of San Cristobal de Las Casas on July 20, just one month after at least 10 were killed in a repressive crackdown on teacher protests in the Oaxacan town of Nochixtlan on June 19. Meanwhile, Mexico saw one of its most violent days between Friday afternoon and Saturday with 51 murders reported across nine states, including seven members of one family in the violence-ridden state of Guerrero and 10 bodies found in Michoacan, La Jornada reported Sunday. Reflecting on recent violence — particularly the massacre of an estimated 20 people including the mayor in the Chiapas town of San Juan Chamula on July 23 — the Zapatistas expressed through a statement by Subcomandante Moises at the kick off of the CompArte festival that tragedies in their communities are the result of meddling by political parties, drug gangs, and organized religion. Over two decades after the masked Indigenous army emerged from the Lacandon jungle and announced its resistance to Mexico and to the world, the Zapatista struggle continues to be an international icon for its ongoing work toward self-determination and new alternatives to global capitalism. Previous PostWhy Not a ‘People’s History of Utica’ Mural in Downtown?